For Information on leagues, contact the Pullman Community Center. For Information on leagues, contact the Pullman Community Center 773-928-1000. For Information on Field Rental, contact the Pullman Community Center. 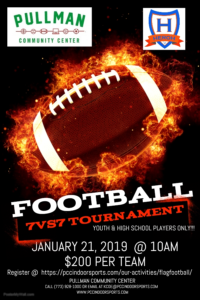 Welcome to the Pullman Center 7 on 7 football tournament being held on January 21st. Please click the link below to register your team for the event. Every participant must complete the online waiver process. Payments can be made online with a credit card or cash payments can be made at the Pullman Community Center. All cash payments must be made by Saturday January 19th. If you have any questions please contact the Pullman Community Center.